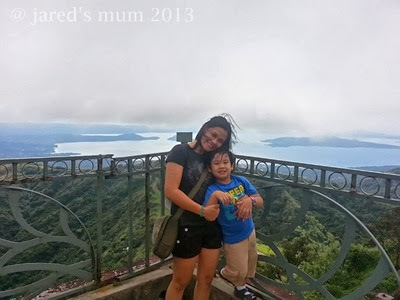 We were blessed to have had a couple of out-of-town trips last year, one of which is a trip back to Tagaytay. We’ve already been to the city a few year’s before the little man was born and I was just glad to be sharing the wonderful experience with Jared. While other people go to places like this clinic to relax and unwind, traveling to Tagaytay where the temperature is always delightfully cold is truly a recommended way to spend the holidays or celebrate a special occasion. There are just so many places to see and visit, where the family can have such wonderful bonding experiences. 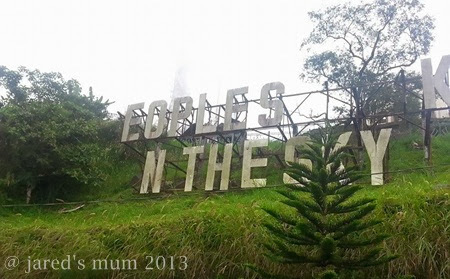 One of those attractions, and sure is everyone’s fave, is the People’s Park In The Sky. Although it did not change much since our last visit, and if it did, I am betting all for the worse. The place look un-maintained and abandoned at best. But people still flock here for the breathtaking view of the rest of Tagaytay City. Entrance fee is very affordable at Php30 per head and honestly I won’t mind paying more if only they can improve the facilities and amenities inside and they ought to begin with repairing the park’s marquee! Anyway, that aside, our trip to the place is a nice one. We arrived early and the morning sun is just enough to keep us warm in the cold, Christmas-y weather. We opted to take the trek up instead of riding one of those jeepneys for hire at the entrance of the park. The little one enjoyed the walk up and was all sweaty and excited by the time we make it to the top. He liked the bridge situated in the middle of the park best and made a number of trips to and fro. There were students taking photos in the bridge when we arrived so I was not able to take a few snaps of my own. Not to mention, Jared was just impossible to follow around with a camera. Besides, by the time we make it to the peak, the grown ups were both hungry so we grabbed a quick bite of hotdog sandwich from one of the stores found there. We wasted no time to go up the viewing deck and the beautiful view of Tall Volcano and Lake is sure well worth the long walk up and this trip. This place sure is one beauty, a national treasure and I promised myself we’d go boating to its crater on our next visit. Of course we made sure to snap some souvenir shots with the very famous attraction behind us. Can you tell it was particularly cold and windy that day? This place will not be called the Second Summer Capital of the Philippines for nothing, after all. Plus my hair all over the place and the partial mist above the lake are such obvious giveaways. It sure was a good decision that we walked up to shake the cold away. Like in most tourist spots, this place was also teeming with souvenir shops. I did look around for a while and was glad to find this cool Tagaytay sando for the little man and these super cute turtles-made-from-little-shells. I also grabbed a couple of local Tagaytay pouch, which I planned to give to my friends when we meet up over the holidays. Jared was also busy looking around and it sure is a welcome change that we tagged along someone else to look for him while he ventured from one shop to the next. We were done shopping for pasalubong sooner that expected. I will let you in on the rest of our Tagaytay adventure in another post. 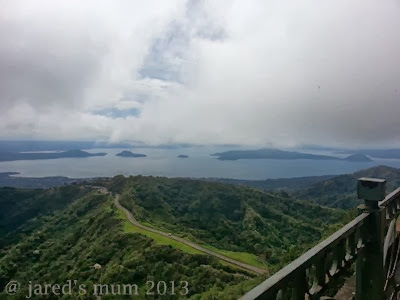 This entry was posted in travel and tagged family time, family travel, parks, Philippines, Tagaytay on January 5, 2014 by Mum Travels. I believe it’s been a decade since I’ve been to Tagaytay. I miss that place. I miss Tagaytyay, I have been there twice years ago. Lovely photos sis. I love the cool winds of Tagaytay! don’t we all? but with this kind of weather, i do not envy people in Tagaytay at this time. it must be freezing there now.